Excerpt: Never shy, Suger gives his readers a large amount of biographical material in his works and deeds not be forgotten. He acquired numerous properties and estates for his abbey, and also improved the ones it already possessed. In this way, he doubled and tripled the abbey’s annual revenues from both its old and its new resources. He built new buildings, barns, walls for villagers, and increased the return of grain from all the abbey’s lands. Suger’s most noteworthy accomplishment, however, was at the abbey of Saint-Denis itself. He enlarged, decorated, improved, and redesigned the church there. Without exaggeration, it is safe to say that Suger became the foremost church architect of twelfth-century France. His innovations and changes at Saint-Denis led to the development of the medieval Gothic style found in so many medieval European churches. Excerpt: In the heady, early years of the Crusader States, commentators from many civilizations viewed the Franks as an unstoppable force, whose eventual victory was all but certain. So, far from anticipating that the Christian invaders would inevitably be driven back to western Christendom, there was a serious concern that the regional capitals of Aleppo, Damascus, and Cairo would be engulfed by marching columns of Frankish knights. So what stalled this advance? When were they forced onto the back foot? Excerpt: Though less well known than the Medici, Benedetto Cotrugli is a perfect illustration of the ways that European networks were evolving in the Renaissance era – ways that created a new cosmpolitan class of interconnected individuals. Cotrugli’s Book of the Art of Trade, is tempting to suggest, the fifteenth-century equivalent of Donald Trump’s Art of the Deal. However, Cotrugli was no Trump. Amongst many pieces of wise advise, Cotrugli warns merchants against involving themselves in politics. ‘It is not expedient,’ he writes, ‘for a merchant to have to do with the courts, nor above all to involve himself in politics or the civil administration, because these are perilous areas.’ Far from glorifying in verbal vulgarity and ostentatious displays of wealth, Cotrugli was a highly educated humanist whose ideal merchant embodied the classical virtues of the commoner-citizen as they had been conceived by the ancient Greeks and Romans and rediscovered by Italian scholars in the Renaissance. Excerpt: Gdańsk is among those few Polish cities whose history is still under the process of being rewritten as a result of the various shifts of it fate over centuries. Gdańsk – mentioned for the first time in written sources in 997 on the occasion of St.Adalbert’s visit – was subjected to the authority of Polish king and dukes. For a short time (1227-1294) it was a capital of an independent duchy ruled by a separate dynasty; then Polish rulers returned. Many German settlers came to first town which was founded in the thirteenth century on a municipal form of government. In the years 1308-1454 the town was governed by the Teutonic Order, that, upon strengthening its rule in Prussia, seized the town by force of arms. From 1454 to 1793, Gdańsk inhabitants, after removing Teutonic Knights from the city, were the subjects of Polish kings and lived in an autonomic province, Royal Prussia, established in 1454. Divided chronologically into ancient, medieval, renaissance, modern, and contemporary periods, and featuring 50 specially-commissioned chapters from leading philosophers, this comprehensive volume is the first of its kind. 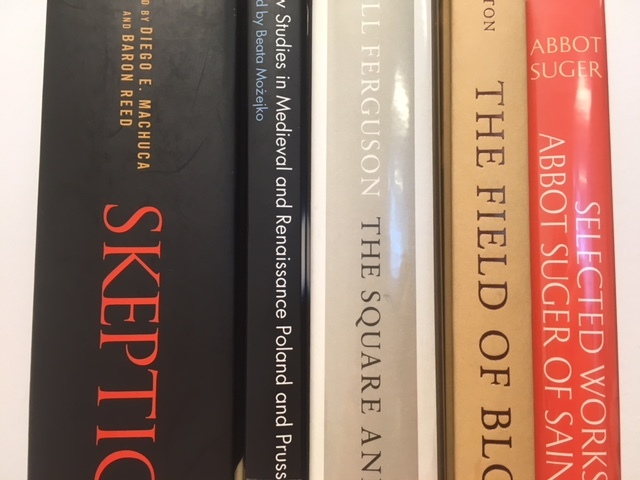 Includes “Augustine and Skepticism,” by Stéphane Marchand; “John of Salisbury’s Skepticism,” by David Bloch; “Skepticism in Classical Islam: The Case of Ghazali,” by Paul Heck.